Super Sport fans take note: The history you have been waiting for has finally been written. 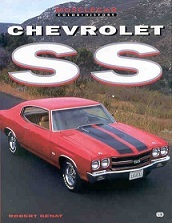 "Chevrolet SS" recounts the entire SS story from 1961 through 2000. This book is essential for the enthusiast who wants to get the most performance out of this new engine design but is only familiar with the older Chevy small-blocks. Covered is everything you need to know about these engines, including the difficult engine removal and installation, simple engine bolt-ons, electronic controls for the Generation III engine, and detailed engine builds at four different power levels. Click for more information and a larger photo.